Wok to Wok is always a good choice! Wok to Walk isn’t exactly a place which you’d call a restaurant perhaps, but they do serve great food! Especially for those who just wanna have some fresh and healthy food. And more importantly, food which is quickly served! 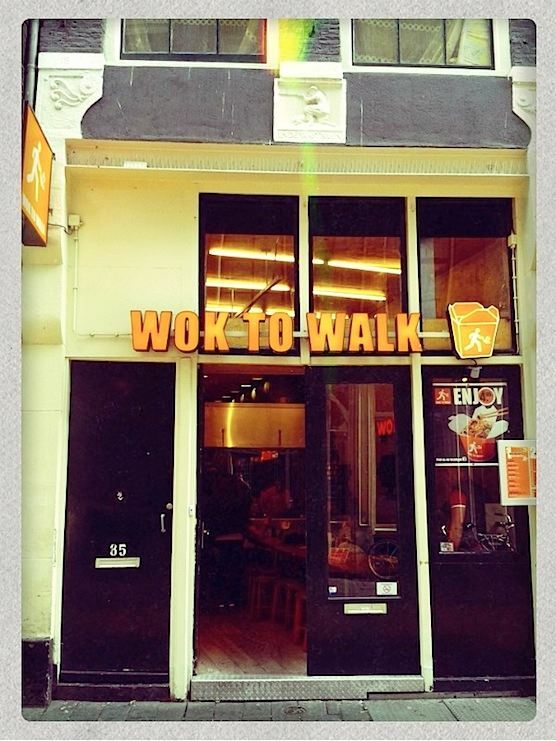 This Wok to Walk is located on the Warmoesstraat 55 in the Red Light District. They offer a variety of tasteful Asian food. Wok to Walk’s menu consist out of three simple steps. One, choose your basic ingredient (like noodles or rice). Two, choose 4 extra ingredients (like chicken, beef, mushrooms, broccoli, etc). Three, pick your sauce (Teriyaki, Oyster, Sweet & Sour, etc). Although the name Wok to Walk suggest that it is a take-away, you could also sit inside if you would like. Wok to Walk is part of an international franchise-chain, which currently has locations in 14 different countries. The whole idea of fresh, but cheap food started in Thailand, but the company was founded in Amsterdam. Wok to Walk has 4 other locations in Amsterdam, next to this one. They can be found on Damstraat 44, Kolksteeg 8, Leidsestraat 96 and Reguliersbreestraat 45.